Charles Eastman was Santee or Mdewakanton Sioux. Born February 19, 1858 near Redwood Falls, Minnesota, his mother (half-Indian) soonafter died and he was named Hakadah meaning “The Pitiful Last.” During his childhood, he learned the skills of hunting and was a member of the Wahpeton Band. One day, due to the success of his team against another in a game much like lacrosse, he was given the name Ohiyesa meaning “the Winner”. When he was just 4 years of age (1862), the Santee-Sioux uprising occurred in Minnesota, forcing Hakadah/Ohiyesa and his grandparents to retreat to Canada. His father Many Lightnings was presumed to be dead. In Canada, Ohiyesa went through his traditional Indian upbringing. Many Lightnings spent his subsequent years in prison, where he was Christianized. Following his release from prison, Many Lightnings searched for his son Ohiyesa, finding him in Canada in 1872. Many Lightnings convinced Ohiyesa to return to the United States, adopt an English name, and begin his formal education in white schools. Ohiyesa then took on the name Charles Eastman, derived from the English surname on his mother’s side. Eastman attended several schools, and then went to Dartmouth College, where he received a B.S. degree in 1887. He then went to the School of Medicine at Boston University, graduating with his M.D. degree in 1890. He began his work as a government physician serving Pine Ridge Academy, South Dakota. During this time, he witnessed the beginning of the Ghost Dance movement. Following the tragedy at Wounded Knee, during which hundreds of Sioux were killed by the U.S. Cavalry, he treated the survivors, still officially hired as a government physician. Eastman met his future wife Elaine Goodale, a poet and educator during this period. He then married her and soon after left his government position to open a medical clinic in St. Paul, Minnesota, in 1893. From 1894 to 1898 he served as Indian secretary of the International Committee of the YMCA. 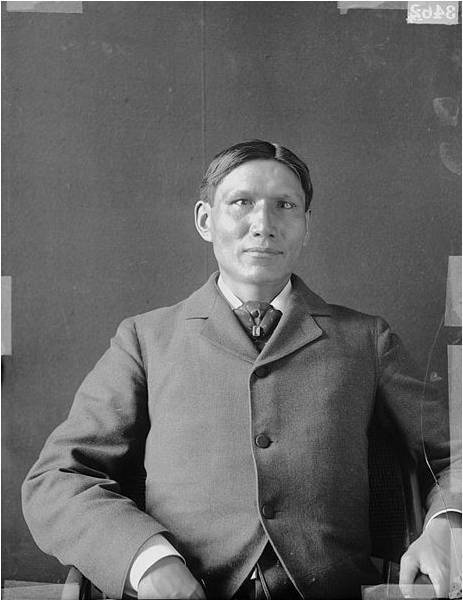 In 1899 he served as an Administrator for Carlisle Indian School in Pennsylvania. Eastman returned to Government work in 1900 (then 52 years of age), employed as a government physician at Crow Creek, South Dakota. From 1903 to 1909 he worked as a head of the revision of the Sioux allotment rolls. Also during this period, Eastman began his productive writing career, using his Indian name Ohiyesa for many of these writings. In 1893, his “Recollections of the Wild Life” was published as a series of articles by St. Nicholas magazine. He wrote several more articles and then, in 1902, with the support of his wife (as proofreader, editor and literary assistant), he published Indian Boyhood, a semi-autobiographical account of Indian life. In 1904, Red Hunters and the Animal People was published. In 1909, Wigwam Evenings: Sioux Tales Retold was published, the authorship of which he shared with his wife. The Soul of an Indian: An Interpretation (1911), Indian Scout Talks (1914), The Indian Today (1915), From the Deep Woods to Civilization (1916) and Indian Heroes and Great Chieftains (1918) educated readers about the Indian history and culture and the current Indian-white relations. Eastman influenced many different parts of white society. Aside from his employment and activities with the Bureau of Indian Affairs, he worked alongside the YMCA 1897-1900, helped found the Boy Scouts of America in 1910, assisted in the development of the Campfire Girls 1914 to 1925, and in 1911 was elected President of the Society of American Indians, a Pan-Indian association. With the experience of Wounded Knee still in mind, Eastman was heavily engaged in preventing further injustices from occurring. He demanded improvements in reservation conditions, focusing on the need for developing better health programs for reservation settings. In spite of his long history of supporting Native teachings and traditions, Eastman did not support the use of Peyote, and did support the Indian Citizenship Act of 1924, arguing this would help the Indians achieve equality. Eastman left his wife in 1921, after which his publishing ceased. He removed to Canada in the late 1920s, where he continued his activities as a teacher and researcher. In 1933, he was the first recipient of the an award from Indian Council Fire for “most distinguished achievement by an American Indian.” Until his death in 1939 (90 years old), he remained active mostly as a lecturer and forever inquiring researcher. The investigation on Sacajawea’s burial site published in 1925 is most likely part of the collection of Letters sent to the Bureau of Indian Affairs, stored in the National Archives as part of a sizeable lot of papers, some of which were reprinted and distributed by the government. With Calvin Coolidge as President, Eastman worked as Indian Inspector for the Government, succeeding James McLaughlin. During these years, he verified the burial of Sacajawea, a Shoshone Indian, on the Wind River Reservation in Wyoming some time after its development in 1812. Most likely, the document posted in this blog (Eastman’s letter to The Commissioner of Indian Affairs, 1925) is a published copy of the text from the original documents (currently in National Archives); unlike the original copy seen (unfortunately), this working copy lacks the US Governmental Documents cover pages and identifier numbers, so they do not appear in this electronic reproduction of it. Marion W. Copeland, Holyoke Community College. 1978. Charles Alexander Eastman (Ohiyesa). Boise State University Western Writers Series, No. 33. Boise, Id: Boise State University. Carl Waldman. 1990. Who was Who in Native American History: Indians and Non-Indians from Early Contacts through 1900. New York: Facts on File. Duane Champagne (ed.) 1994. The Native North American Almanac. New York: Gale Research, Inc. Editors of Salem Press/Harvey Markowitz (consulting ed.). 1995. American Indians (3 vols.). Volume 1. Pasadena: Salem Press, Inc.
Sharaon Malinowski and Simon Glickman (eds.) 1996. Native North American Biography. New York: Gale Research. Bruce E. Johansen and Donald A Grinde, Jr. 1997. The Encyclopedia of Native American Biography. Six Hundred Life Stories of Important People from Powhatan to Wilma Mankiller. New York: Henry Holt and Company. Harvey Markowitz (ed.). 1999. American Indian Biographies. Pasadena, Calif.: Salem Press, Inc.